Visit the incredible landscapes of Death Valley on this day trip from Las Vegas. Known as the hottest and driest place in the Western Hemisphere, this unique area is a photographer’s paradise. Journey through rugged terrain of the Mojave Desert and marvel at the extreme desert environment bursting with vibrant color as your guide takes you to the must-see highlights of this fascinating national park. Round-trip transportation by air-conditioned mini-bus, lunch and plenty of bottled water are included. Visit one of the most unique landscapes on earth on this full-day, small-group trip to Death Valley National Park from Las Vegas. You will be amazed at the sheer size and astounding natural features of this national treasure. After an approximate 2.5-hour drive from Las Vegas by comfortable, air-conditioned van, arrive at the heart of Death Valley National Park in the Mojave Desert. 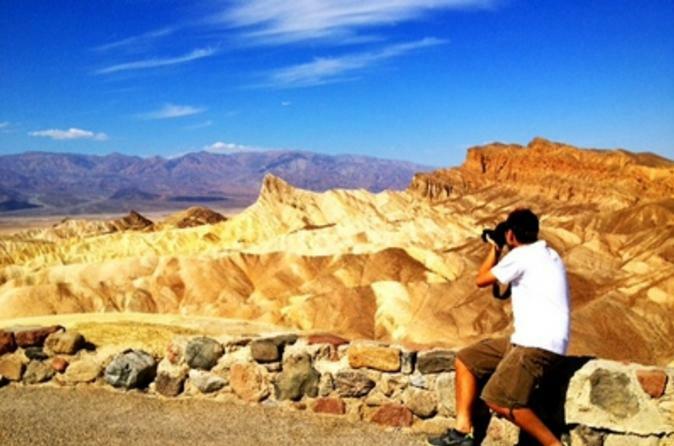 Enjoy breathtaking photos opportunities at Zabriskie Point, located just east of Death Valley, known for its erosional landscape. Admire cascading hills and valleys on a scenic drive through stunning Artist’s Palette, a rock formation illuminated in vibrant colors, before stopping at the salt flats of Badwater Basin. At 280 feet (85 meters) below sea level, this is the lowest point in the Western Hemisphere! Next, head to the Furnace Creek visitor center. Furnace Creek is the ancestral land of the Timbisha Native American tribe, and is also one of the hottest places in North America. Temperatures are known to reach as high as 135°F (57 °C)! Here, browse the Death Valley gift shop before traveling back through the Mojave Desert in time for some your Las Vegas nighttime activities.